Having a bright white smile is a symbol of health and confidence, but there are plenty of every day habits that can make your smile dull or discolored, such as drinking coffee, wine, and soda, smoking, or even taking certain medications. At the cosmetic dental office of Dr. Julie Thomas, we help you reveal a whiter smile with teeth bleaching in North Canton. 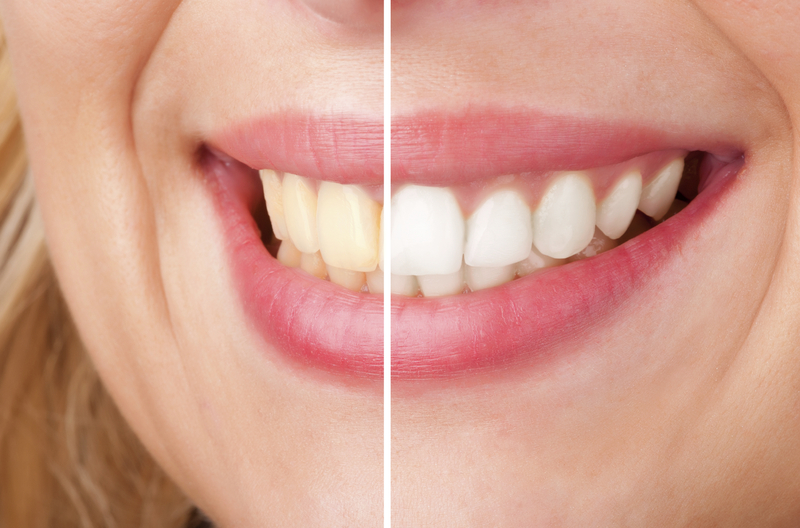 In-Office Whitening – When you need a whiter smile and don’t have time to wait, you can take advantage of our same-day whitening treatments, which include Zoom! and Opalescence Boost. These in-office whitening procedures include the use of professional strength whitening gel to help lift stains on teeth by an average of three shades. Zoom! is activated with the use of a special light, while Opalesence Boost is chemically activated to lift stains. Both treatments produce visibly whiter smiles in an average of just one hour. Take-Home Whitening Kits – For patients who prefer to whiten their teeth at home, we offer customized whitening solutions that cannot be found over the counter. We use the same trusted brands for take-home kits as our in-office treatments: Zoom DayWhite and Opalescence PF, which utilize custom tailored trays that fit your smile just right to deliver ideal results. These professional strength take-home whitening brands are able to deliver the results you’re looking for, from the comfort of your own home. Regardless of which whitening method you select, you can see real results through our professionally supplied bleaching kits and treatment customization. Our cosmetic dental team helps you find the right solutions for your whitening needs, while helping to limit teeth sensitivity. One of the most important parts of the whitening process is maintaining your results with proper at-home care and products. Dr. Julie and her team believe in the efficacy of popular and trusted Philips brand whitening products. We keep your smile white at home by offering Philips Oral Care whitening tooth pastes and touch-up whitening pens that allow you to maintain your results after your initial whitening treatment is complete. Learn More about Getting a Whiter Smile – Contact Our Office Today! Dr. Julie and her team can help you achiever a bright, white smile in less time than you think. For more information on same-day teeth whitening in Canton, or our custom-made home whitening kits, call our office today for your consultation.